There is a movement of love afoot. Maybe it's because this is what I'm looking for in order to write about it, or maybe others have decided that what we must do is combat violence and hatred is start talking about love more, start living love more. As they've appeared on my Facebook and tumblr feeds, I've reposted them but I thought I would collect some here, with original sourcing where possible (in other words, trying to be a good internet citizen). This quote (and I encourage you to read the whole thing on Scott's Instagram account) begins with acknowledging blessings, then with liking oneself, then with small acts of kindness. In various small ways, love can enter the world ... and it's through each of us bringing a small piece of our hearts to the table. It's a beautiful summation of sitting with something (being still) and then taking compassionate action. She says it much better than I did. 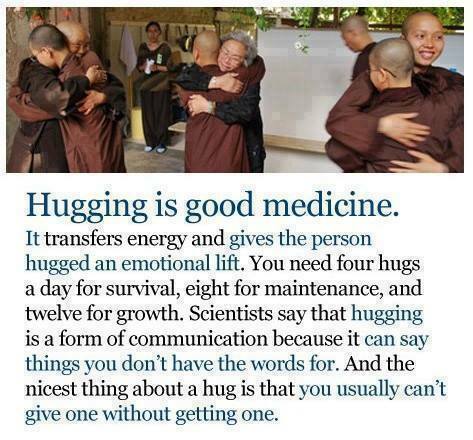 Hugging is good medicine, is an image shared on Facebook by Beloved Festival https://belovedfestival.com/ which happens yearly in Portland, Oregon. So that's this month's "love moments" I guess we can call them without sounding weird or creepy? (Sorry, I just watched a Tina Fey/Amy Poehler trailer. Everything seems to have a double entendre now.) No? Well, let's just stick to calling them God's love stories and I hope they find ways to transform your life with love. Where have you seen the movement of love occur online and in life? Please share in the comments and I may add them to the next instalment!